Khao Lak Scuba Diving is run by experienced dive professionals who live in Khao Lak all year round and have decades experience with diving in Thailand . What makes us the top online dive center in Khao Lak is very simple : We 're professionals and we take care of our guest. 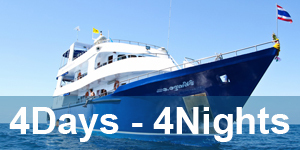 We offer tailor made dive solutions for your dive holiday wishes. Once booked with us we offer the best service in Khao Lak . We have a 24 hour service line, a office and a Mares retail store in the center of Khao Lak where you always can walk for any question about diving , a chat or inside tips about what to do around Khao Lak. When you book with us , you don't have to worry about unexpected costs once you arrive in Khao Lak. Our prices are all included, if you have any special wishes , like Nitrox or private guide, please let us know and we will make a quotation for you. When you book with us you pay a deposit to confirm your booking , the open balance you pay on the day you're going onto the liveaboard. At Khao Lak Scuba Diving we offer a liveaboard solution for your diving wishes. 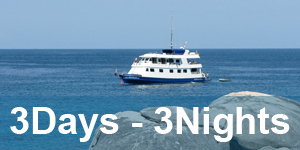 For a short liveaboard trip , we have daily transfers out to our liveaboard vessel at the Similan islands where you can choose to stay for 1, 2 or even 3 nights. 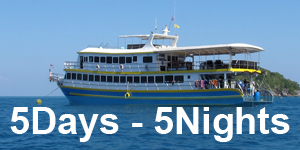 Or go on a longer liveaboard trip 3 , 4 or 5 days , where you visit the best divesites in the Andaman Sea ; Similan Islands,Koh Bon, Koh Tachai, Richelieu Rock and Boonsung wreck. Khao Lak harbour is the shoriest way to the best diving in Thailand : With daily departing daytrips and liveaboards , Khao Lak is the best place to start your diving adventure. Not overcrowded and with it's 20 kilometer of scenic beaches this little beach town offers the experience of nowhere offered in Thailand.